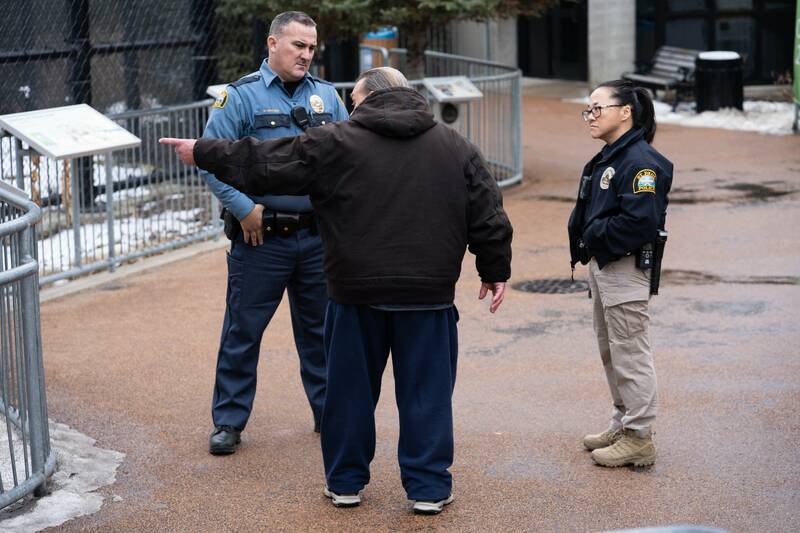 It was a rainy weekday morning when somebody called police to report a woman had been camped out in her car in the parking lot on Harriet Island. She'd been throwing cigarette butts and litter on the ground and the car was parked across a couple of spots. The caller wanted her gone. As 911 calls go, this was relatively dull: no high-speed chase, no pulled gun. It wasn't even dark out. She could have gotten citations for the cigarettes and the litter, the lousy parking, or for spending the night in the park. But when St. Paul police officers showed up in two police cars, they realized they knew her: one of them had gone to her house a few times for mental health calls, and she'd always been too paranoid to let them into the house. So rather than give her a ticket, they called in the St. Paul police mental health unit. Now, even as a mental health crisis call, this isn't the stuff of high drama. In some ways, though, that makes it harder for officers to know how to respond. All of the officers in the St. Paul Police Department are trained in dealing with a mental health crisis, so if the woman were threatening to hurt herself or was psychotic and needed to go to the hospital, the officers would have known what to do. But this time, she wasn't a harm to herself or to others, so police couldn't take her to the hospital if she didn't want to go. And even if she wanted to go, it wasn't clear that that was what she needed. In some ways, this kind of situation, where there isn't really an emergency, is harder to deal with, said Sgt. Jamie Sipes. He coordinates the mental health unit which pairs officers with social workers. "The officer recognizes there's something that needs to be done," said Sipes, "but they're not sure what that is. That's when we can engage that specially trained officer and the social worker." For now, the unit, which started in the spring, has four officers and two social workers. The St. Paul City Council approved the budget to add three more officers, which will nearly double the unit, to seven officers. About 1,500 cases have been referred to the unit so far this year. 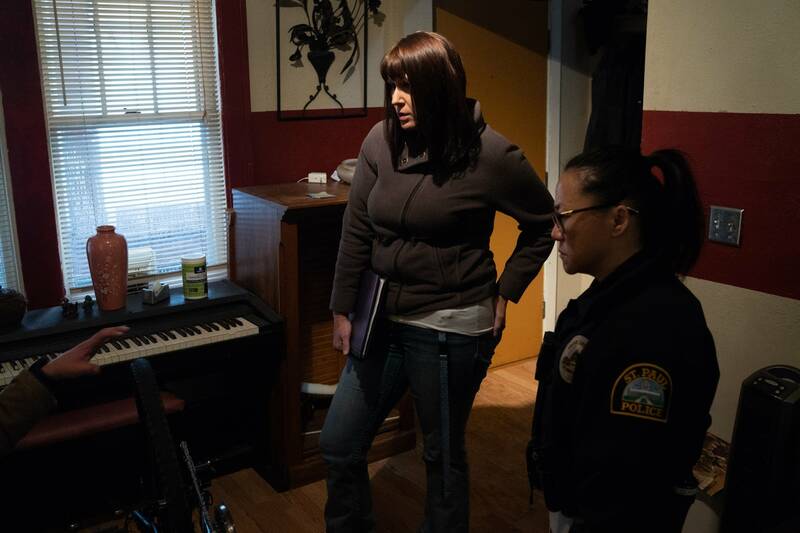 At the Harriet Island parking lot, mental health unit officer Justin Tiffany and social worker Amber Ruth pulled up in an unmarked minivan, not a squad car. Tiffany hopped out to confer with his fellow officers, then came back to tell Ruth what he learned — that his fellow officer knew the woman and that in the past "she would present as very paranoid," Tiffany reported. "She was calling and saying that people were breaking into her house." "Obviously she's allowed to be here," he said, "It's a public park and stuff like that but if we can offer her some kind of assistance, I think it would be beneficial for everybody." Then it's Ruth's turn. She got out and approached the woman's car. The idea of the whole interaction is to be as nonthreatening as possible, which is why she and Tiffany use the minivan, and why she's wearing jeans and a sweater. Ruth spoke to the woman to make sure she was OK, then found the woman a crisis bed for the night and told her to get in touch the next day if she wanted to be connected to help for her mental health and housing issues. "We meet the consumers where they're at," she explained later. "If they feel more comfortable meeting with me in a clinic setting, we can make those arrangements. Otherwise, I can meet them in their home, in a park, in a centrally located area in the community. It's really up to them." 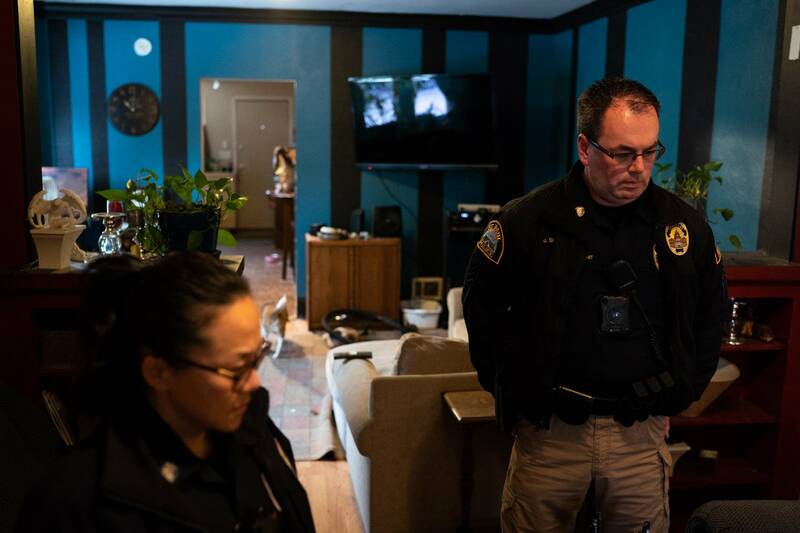 Like law enforcement agencies everywhere, the St. Paul Police Department gets a lot of calls for mental health crises, which take a lot of officers' time and cost a lot of money. So far this year, Ramsey County dispatchers have handled almost 6,000 calls involving mental health. That's about 2 percent of incoming 911 calls. The idea with the mental health unit responding to these kinds of calls is to keep people like the woman in the parking lot from ending up in a crisis and needing the police to help deal with it. Steve Allen, who follows these issues for the Justice Center at the Council of State Governments, says creating this kind of team is part of a larger acknowledgment that it might be a mental health issue, but the police still often end up having to deal with it. "Having proactive services can help alleviate a lot of the crises in the first place along with the expensive responses both emergency departments, jails and other systems that are engaged to help address a crisis," he said. Both Regions Hospital and People Incorporated have joined the effort, funding salaries for the unit's two social workers. That doesn't mean it always works. Ruth, the social worker, says the woman she talked to in the parking lot that day never followed up. Which just happens sometimes. Still, the unit thinks it works often enough that they keep trying. And with more officers coming on the team, they'll be able to respond to even more calls.